Robi has been the number two player in Bangladesh in terms of only revenue market share before the merger with Airtel. Following the merger with Airtel in 2016, we emerged as the number two player in Bangladesh in terms of subscriber and revenue market share. We currently have a subscriber market share of 30%, with revenue of US$818 million. We launched 4G in 2018 and have since taken an aggressive stand, with a 4G market share of around 50% in terms of Facebook users. What are the unique challenges that you face in Bangladesh? We have taken leadership in 4G, and we are the market’s fastest growing operator – however, we are still struggling in terms of profitability. In a sense we are at a break-even point, and there are multiple factors behind this; in Bangladesh, our voice rate is one of the lowest in the world and our data rate is also among the bottom few. That is a big factor, but taxation is another major issue – we are in the top five highest-tax markets in the telecom sector. Of each $100 in revenue, $46 is paid to the government in different ways. The third major challenge is spectrum price – if you adjust this for GDP, Bangladesh is again among the highest in the world, making our business model very vulnerable. When we were merging with Airtel Bangladesh, our profit after tax was around -10%. As of today, we’ve been able to break-even with the support of a one-off gain from investment disposal and we’re aiming to bridge the gap in the coming years driven by the increased scale of the business created by the merger. How is the government helping operators achieve profitability? The Government in February 2019 declared the leading player in the market to be a Significant Market Power (SMP), since it has more than 50% of the revenue market share. We have been lobbying this case for years, as they had gained a first mover advantage and this was the reason why we could not become profitable. We expect this new SMP decision to bring some market corrections and facilitate levelling of the playing field through differentiated & favourable pricing conditions, taxation etc. 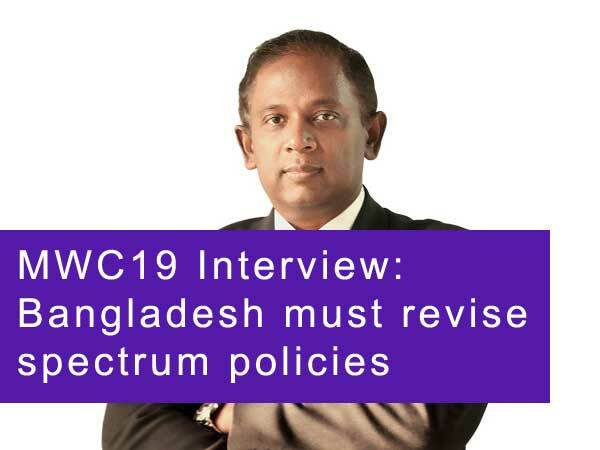 We have been in continuous dialogue with the Government; the current administration in Bangladesh has promised to look seriously into spectrum pricing. At the end of the day, unless there’s a good business case, nobody is going to buy spectrum for the exorbitantly high asking price. They have realised that the last two auctions didn’t work for the Government – similar to the Indian market – because the spectrum was overpriced. They have issued directives related to quality parameters but these won’t work unless the spectrum is more affordable. For perspective, more than 40% of the spectrum in Bangladesh is sitting idle, delivering no usage value, so there’s a good incentive for the Government to reconsider its stance on pricing. One approach Government is currently considering is to offer a volume discount on purchase of spectrum in bulk. Bangladesh has adopted ideas from regional neighbours without looking at the wider context – for example, as opposed to the unified licensing regime, Bangladesh has split up the licensing regime, drastically limiting the scope of our operation. In India, operators are able to build their own towers or fibre, but in Bangladesh we can’t lay our own fibre, can’t set-up our own International Gateways and Interconnection Exchanges (the call transferring exchange for routing calls to other network operators- something that is only found in Bangladesh). There’s a lot of intervention, which has led to a fragmented licensing regime, pushing up costs and complexities of the operations. When the Bangladesh government considers spectrum price in view of Indian example, they’re not factoring in how India has crafted the regulatory regime in such a way that it delivers lower prices to operators. How can you reduce expenditure as you’re deploying networks? We have been working with partners such as Huawei and other vendors to improve efficiency. We’ve implemented one of their solutions for dynamic usage of the allocated spectrum and it’s showing good results in spectrum efficiency – it can double the throughput performance. We are also improving our analytics in terms of tower planning to get better return on investment - previously, the tools available were very limited. We’re now able to get a clearer picture of the number of subscribers using the Internet in order to better map an area and determine where coverage is required. There are social factors that Facebook has information about - such as which stores subscribers are using - which allow you to form a picture of spending power. They can use multiple variables and parameters to suggest places where we should invest. Vendors such as Huawei have a lot of tools which we can use in designing the best ways to place and use the spectrum, as well as manage the scarcity of it. 6-sector technology for example can be used to increase capacity by up to 40-80%, but at the cost of marginally reducing the quality. The entire market will not be so sensitive to quality – people in urban areas are typically happy to spend more for quality, but in remote areas they might be happier to compromise on quality as there’s often less spending power. Scarcity of spectrum is an issue but cost is the most problematic factor. Improving efficiency is therefore always a good idea – even if we receive a volume discount, acquiring spectrum is still very expensive. In an urban area, making a business case for putting up a new tower or acquiring new technology from the vendor is a little easier because we’re able to offset that cost, but in a rural area, things can get difficult. We tried to find a rural solution with technical support from Huawei, but we are yet to find a proper business case because Bangladesh has a challenging climate situation, unlike the USA or China. But I believe a solution will come as a result of collaborative effort with our partner. You’ve used digital services as a major differentiator – can you tell us about this? We’ve been working on financial inclusion – bKash has been a big success story in Bangladesh, and when they started operations in 2010-11, their first telecom partner was Robi. We’re now acting as more of a distributor and platform provider. Unfortunately, we are not allowed to offer mobile financial services (MFS) ourselves. We feel that excluding the telco sector from MFS has slowed the country’s progress towards financial inclusion. We’re also working on utility bill payments, with the government gradually becoming more digitalised – in these sectors, 95% of users opt for post-paid, unlike in developed markets. We are taking content to rural locations – we’ve recently started working on digital education. Robi-10 Minute School is a GLOMO Award-winning service that we’ve launched – it began as a sort of CSR initiative, but we’re getting it towards a sustainable model. In Bangladesh, there is a huge inequality between rural and urban when it comes to access to quality education. There are talents all over the country, but simply by having better access to education, people born in urban areas have higher probability of success. The scarcity of good teachers is a big issue, so we’re creating digital educational content through Robi-10 Minute School. We’ve started digital classes to allow those in remote locations to interact with renowned teachers based in the urban areas – we’ve trialled the scheme in some of Bangladesh’s remote islands which don’t have any digital access, so, if the service works there, it will work anywhere. Initial feedback is pretty encouraging.